(This posting continues the discussion related to my Helsinki WDC critique last week). Helsingin Sanomat newspaper featured Helsinki WDC critique as their main story in the culture section yesterday (unfortunately you need to be a registered subscriber to read the article). The three featured protagonists were myself, Teemu Leinonen from Aalto University Media Lab and Kaj Kalin. 'Big players are priviledged? ': WDC focuses on working with traditional big companies, museums and universities. Small organisations and companies will not benefit of the year. 'Lack of transparency in decision-making': It is unclear who is making the decisions and based on what expertise. Helsingin Sanomat managed to get Pekka Timonen, the director of Helsinki WDC to comment these issues. His answers do clarify things, so at least regarding point 4 (lack of transparency) there is now some progress. Timonen explains that the producers sorted out all the proposals that WDC received to 3 different piles: 'yes', 'no' and 'maybe'. Afterwards the Helsinki WDC board has been going through these piles. The Helsinki WDC board members are: Tero Vähäkylä (chairman, has worked as President of Home Business Area of the Fiskars Brands company and earlier as CEO of the Iittala Group), Helena Hyvönen (Executive Dean, Aalto University School of Art and Design), Juulia Kauste (Director, Museum of Finnish Architecture), designer Mikko Koivisto, Anne Korkiakoski (Communications and Marketing Director, KONE Oy), Petri Peltonen (Department Manager, Ministry of Employment and the Economy), Riikka Salokannel (Development Director, Lahti Science and Business Park), Matti Uusitalo (CEO, Halti Oy) and Professor Mari Vaattovaara (Professor in Urban Geography, University of Helsinki). I will let the readers draw their own conclusions of how well equipped this board is to be in charge of the Helsinki WDC programme. In my own opinion there seems to be a strong bias towards the corporate world and a serious lack of insight towards digital design, visual arts, urban activism, etc. At this point it's probably worthwhile to comment one apparent contradiction in the critique. We say that there should have been more experts from diverse disciplines involved in the process, but wouldn't this have made the organisation even more heavy, buraocratic and expensive? The answer is no. The normal procedure to handle large amounts of applications is to divide them to several different categories and appoint a separate committee of experts for each category. The members of this kind of committees (for Finnish Cultural Foundation, Finnish Arts Council, etc) work for free or they only get a nominal fee. It is considered to be an honorary position to serve in such a committee and a great opportunity to get an overview of what is going on in today's art and/or design scene. These expert committees don't even have to make the final programme decisions, it's enough if they make a list of recommendations for the board. This is pretty much the way applications are handled in the City of Helsinki Cultural Office, where Timonen worked as a director just before starting at Helsinki WDC. So - this top-down arrangement is not an arbitrary choice or a mistake, it's a clear decision to keep out the local scene from the decision-making. And as Timonen said in his reply, he is satisfied in the way Helsinki WDC is realised. Now, instead of dwelling on the application process, I would like to highlight one comment from Timonen which is perhaps even more revealing. The article states that 'all applications related to visual art exhibitions had been left out of the process'. In the case of Pixelache, I was quite astonished to discover (when one of the producers finally had time to meet us) that our proposal had been considered 'art' and therefore not a priority for WDC. It's true that the tagline of our festival is 'festival of electronic art and subcultures' and that we get most of our funding from 'media art' category. But this does not mean that we wouldn't be a significant actor in the design scene! In all less conventional art and design work, the borders between traditional disciplines are very fuzzy. 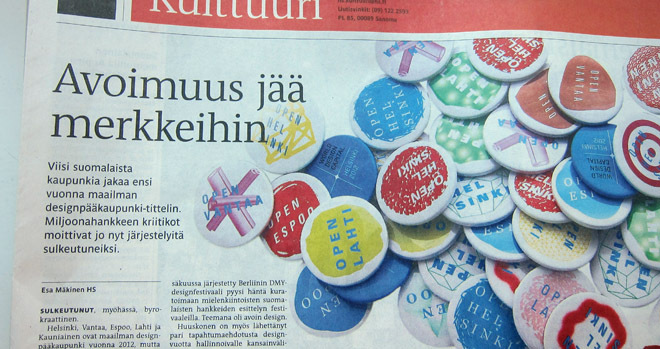 And more importantly - regarding the theme 'Open Helsinki: embedding design in life', I consider it as a grave mistake to ignore the proposals from the arts scene. Site-specific and community art practice has a strong tradition in working with communities and realising projects in public space. If Helsinki WDC wants to 'embed design in life' then artists can bring different perspectives to what kind of 'life' we could be living. The same goes for grassroot citizen activists. I'm not saying that the art scene should get a significant amount of funding from Helsinki WDC, but it's arrogant to ignore it altogether. In the end it's really a question of how the theme 'Open Helsinki: embedding design in life' is understood, whether it's an inclusive theme that can invite all kinds of actors to be involved, or whether the focus is on traditional, conventional design scene. Related to this, I would like to refer to the points made by John Thackara, who was one of the guests of the Aalto Wellbeing project launch event. 'More focus on wellbeing means, for example, less focus on the highly-branded products, services and spectacles that comprise a big part of the design industry's traditional work. '.